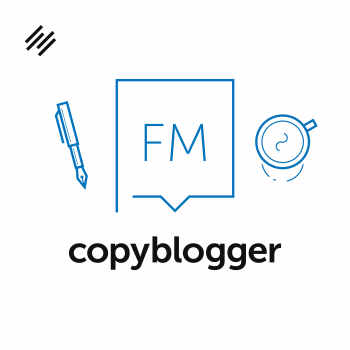 Then, I kicked off my return to Copyblogger with a call to go back to basics. From there, I wrote for five weeks about developing a content marketing strategy that actually works from the empathetic perspective of the prospect. So, we’re in no way saying that marketing technology is a bad thing. But it has to complement the connection your content creates with your audience — it’s not a substitute. That’s what we’re talking about in this episode, and who I’m talking about it with will be a treat to long-time listeners. Robert Bruce has triumphantly returned as my co-host after avoiding getting behind the mic for a couple of years. You’ll enjoy the dulcet tones of Mr. Bruce’s voice as we get to the root of the marketing automation issue. 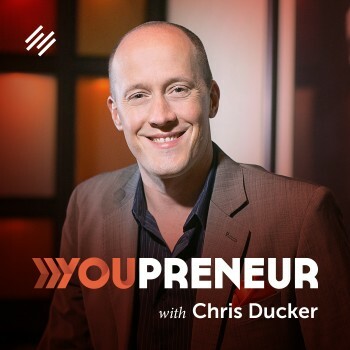 And you’ll also hear why I’m replacing my solo lessons with these new co-hosted episodes, as well as the answer to questions related to the differences between our new StudioPress Sites and the Rainmaker Platform. Robert Bruce: My name is Robert Bruce. I am vice president of marketing for StudioPress, and aside from this very gig, I am utterly unemployable. 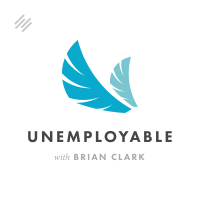 Brian Clark: Hey, hey, hey, everyone, and welcome to Unemployable. I am your host Brian Clark, founder and CEO of Rainmaker Digital, which last time I checked owns StudioPress, Robert, which means you have a job. Robert Bruce: Yeah, Brian, that’s right. I do have a job, and thank you for bringing that up on the show called Unemployable. I have a theory, though, that all of you unemployable types out there deep down secretly you know that the lieutenant is actually the best gig, the number two. See, here’s the thing. I get all the autonomy, all the freedom to do my job as I see fit — until you call or email me — with none of the stress. You are the one who has to handle all the bullshi*t, right? I don’t need to worry about any of it. So in a way, and certainly within this gig, I’m absolutely unemployable. 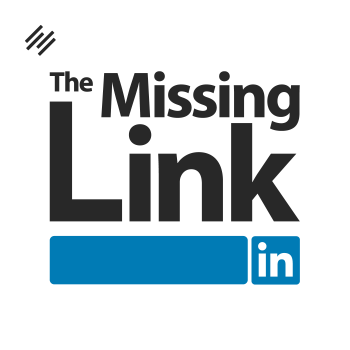 Brian Clark: Well, keep it up, and you may be unemployable in another way, my dear poetic friend. No, no, no. Those of you who’ve been around the block with us for a few years know that I convinced my esteemed co-host, Robert Bruce, to come back after he rejected me last year. Robert Bruce: A little busy. 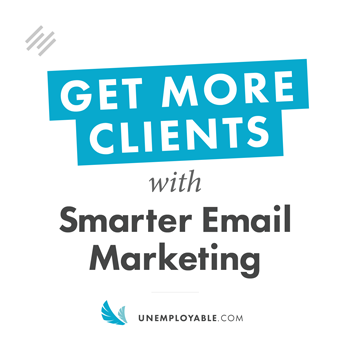 Brian Clark: But yeah, dating back to 2010, remember the original Internet Marketing for Smart People podcast? Me, you, and Sonia, we’d show up. It would be a train wreck every week. Give the audience a feel for how good we were at podcasting back then. Robert Bruce: Yeah, train wreck is a good way to put it. What’s funny is we were trying to figure out the medium, which it’s not that difficult, but with no audience. And we were talking in audio at a time in 2010 when things hadn’t really caught on yet to a bunch of writers, in terms of our audience. It was interesting. But yeah, I think mostly we just got on there and bitched and moaned and complained about various states of the business. Brian Clark: Yeah, and that was fun. Robert Bruce: Oh it was great. It’s the best way to go, the best kind of show to have. Brian Clark: It was good for us. We don’t know if anyone else liked it. But then fast-forward to 2014, and we’re gearing up to launch the Rainmaker Platform. 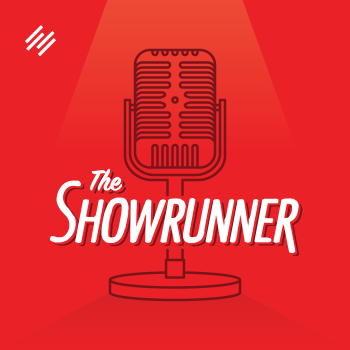 We’ve got this new podcast called New Rainmaker. I started off with a few lessons solo, and then you come in as co-host. Those were good times. You can tell the difference in quality, preparation, equipment, everything just four years later. Of course, 2014 was really kind of the year that podcasting took off. Robert Bruce: Yep, yep. Everybody knows the story of Serial and the mainstreaming of the podcast. And it’s still long, long way to go, but man, I still feel like it’s early days. It’s way early days with this stuff, for all those reasons we’ve talked about. 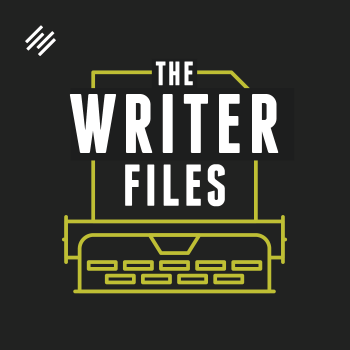 Brian Clark: Yeah, I think I’ve had conversations with three different people who have succeeded recently with newer shows, and it all happened every year. It’s just positioning, finding the audience need, serving the gap, all of that kind of stuff. Probably the question people might be asking right now here in 2017 is, just over a month ago, I kicked back up Unemployable, and I said, “We’re going to do one interview a week, and then we’re going to do one lesson from me.” That’s what I did for the first three weeks that we got going. And here’s what I found. Those individual lessons, only like 10 minutes of audio, it’s maybe 2,000 words of written text that I had to write ahead of time, and then you have the stress of recording it. Robert Bruce: And the stress of the monologue. Robert Bruce: How did you come to that knowledge? You don’t have to get all very specific, but generally, how did you come to understand? Was it just raw stats that the interviews were doing better than the teaching episodes? Brian Clark: Well, yeah, of course. We’ve got the download numbers, and the disparity between the two was remarkable. The social sharing was pretty obvious as well. All the indicators that you look for with content as to, did this resonate with people? Did it spread? Was it shared? All of those basic criteria that you might look at with an article, for example. That was good to find out, obviously, given the amount of work. But at the same time, you’re told, “Okay, you’ve got to be consistent in order to build an audience and to have that know, like, and trust,” and all of that good stuff. That’s true. Yet if you get indications that your audience prefers A over B, it’s your obligation to pivot toward the audience. We’ve been saying that forever, minimum viable audience, all of that. They’ll start telling you what they need, what they like, and you have to adapt to that. But on the other hand, you’ve got people who are like, “Well, I said I was going to do it this way, so I’ve got to stick with it.” No. Was it Emerson who said, “Foolish consistency is the hobgoblin of little minds”? That’s why commitment and consistency is such a powerful influence factor. Human beings are like, “I don’t want to look like a flake, so I better stick with the path even though it’s heading me right off a cliff.” No, no. That’s not what you do as a content producer. Robert Bruce: Yeah, and on the other side of that coin, if you don’t choose to do that, then you can’t complain about being left in the dust and into the dustbin of irrelevance, so to speak. Because that’s something you hear a lot, too — “I’m doing all this great work. I’m consistent. I’m on the ball,” with whatever it is, podcast or otherwise, “that I’m working on,” but if you’re not listening and you’re choosing not to go where your audience is or where they want you to go, you can’t complain about not making it, right? Brian Clark: Yeah, I think that’s correct. Robert Bruce: Our generation is, “Hey, man, just do your own thing. Don’t let anybody tell you what to do,” which is the exact opposite of what … and it’s different between talking about the arts versus business or whatever. But yeah, if you’re going to do that, that’s fine. Just don’t complain about it. 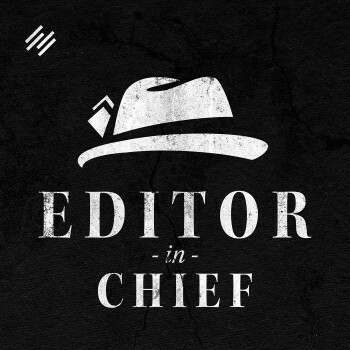 Brian Clark: Yep. So faced with this data, this existential crisis, I said, “Robert, are you willing to come back to the show,” and surprisingly, you gave me no resistance. A year ago, you were like, “No, I don’t want to be in front of the mic. I want to be behind the mic. I want to produce. That’s all I want to do.” Why do you think you had the change of heart? I would say, but it’s going to sound self-serving, that your new role as VP of marketing for StudioPress has got you pretty jazzed up about what we’re doing over there. Robert Bruce: Yeah. That’s definitely part of it. Part of it is that you asked, and I am employed by you. Brian Clark: That was the same thing as a year ago. Don’t give me that. Come on. Robert Bruce: No, no, no. I think maybe a break was good for me, and thankfully, I was in a position, mainly building Rainmaker.FM, and then everything that came along, of course, as you just mentioned with StudioPress. It was good to take that break. It’s not like I’m going to crack the world open with amazing insight here, but when you asked, I guess right time, right place. Actually, a big part of it, too, is I love the Unemployable brand. There’s probably some nostalgia going back to the shows, like you said, that we used to do and doing a show with you again is … I’m for it. So here I am. Robert Bruce: And for the record, I thank you for asking me. Brian Clark: Oh, no, it’s my pleasure. It’s one of those things going back to I really enjoy doing the interviews. You do some prep, and you do some coordination. But it’s truly an enjoyable experience. I’d say the same thing for this. The plan going forward is we’ll continue to have one interview per week, and then we’ll have Robert and I tackle your questions, topical stuff floating around the webosphere. Can I say that, ‘webosphere’? Robert Bruce: I think you can, yeah. Brian Clark: Yeah, it’s my show. Ha! Robert Bruce: How will people ask questions, Brian? Is that follow you on Twitter @BrianClark? Is that the best way? Brian Clark: Well, you could do that. Sometimes I ask questions on Facebook, but the newsletter’s probably the best thing. We used to do the recorded questions where we could put people on the air. I think that made some people skittish. I don’t know. But I’m going to create a forum or something and just have people send them in, and we’ll pick some good stuff to answer. 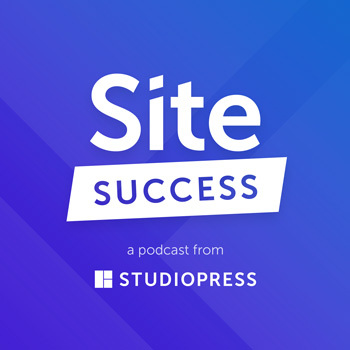 But before we get going we need to really point out that, of course, this episode is in fact brought to you by StudioPress Sites, which is our new hosted WordPress solution that brings you the ease of an all-in-one website builder with the flexible power of WordPress. We’re talking 20 mobile optimized HTML5 designs included, fast loading performance, zero hosting hassles, rock-solid security, world-class support, advanced SEO functionality, automatic updates, one-click install of included plugins. What more could you ask for, Mr. Bruce? Robert Bruce: If you’re into WordPress and you’re running a WordPress site, not much more. This is really cool because this is something that we’ve all, in this company anyway, been thinking about for quite a while. StudioPress as a brand and as a product is really, really valuable to us and to the community around StudioPress. So coming out with this new StudioPress Sites product, number one, it’s been a lot of work, let’s be honest, but I think it really hits a place that people have wanted and needed for some time. Part of that at least, I think you said it the best, it’s just the ease of having everything in one place but still not losing any of the power or, as you say, flexibility of WordPress at all. Brian Clark: Yep. And you can check it out for yourself of course at StudioPress.com. 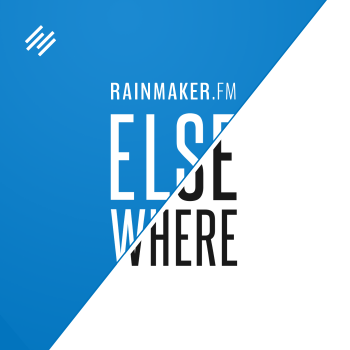 What’s the Difference Between StudioPress Sites and Rainmaker Platform? I can understand the question, and yet they’re apples and oranges when you really think about it. 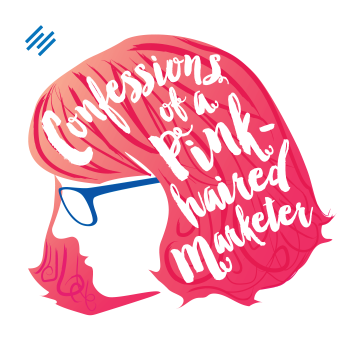 For a long time at Coppyblogger, we didn’t use marketing automation. We didn’t use anything other than great content, a robust website that stayed up during heavy traffic, and big email list. 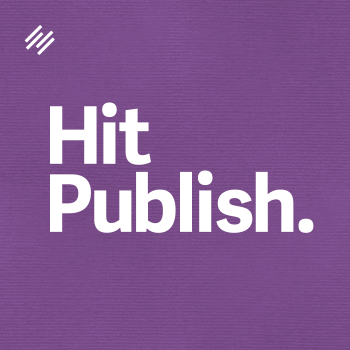 We leveraged the power of audience, and we made it all the way to $10 million in revenue. That is not typical. Your results will vary. 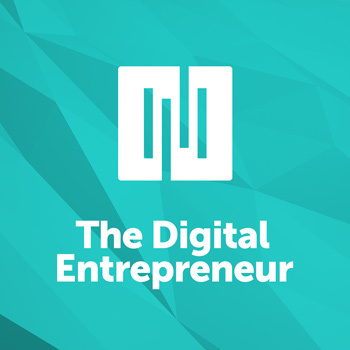 But the back-to-basics aspect of what really works of connecting with an audience, building that audience, and then earning the trust enough to implement your business model — whether that’s product, services, affiliate marketing, what have you — a lot of that can be done with just a really good WordPress install that doesn’t bog you down with the technology. Ever since 2008 when we got into the WordPress space, this has been our goal for writers, content creators, other creative entrepreneurs that don’t want to mess around with the downside of WordPress, which is sometimes it’s pretty difficult to use. Sometimes it gets insecure really quickly, thanks to certain plugins and themes, things going out of date, and all of that. You’ve got to hunt around for the right stuff. So StudioPress is really a combination of something like a Wix or Squarespace but without locking you into that SaaS platform and still allowing you the freedom to use the plugins and what not. Maybe this is your second-level hosting solution. Maybe you started out, like a lot of people do, on the $5 a month thing, and you went through all the nightmares of your site going down as soon as you got some traffic. Then you’re dealing with updating a plugin that breaks other things and all of this kind of stuff that makes it maddening and distracts you from the goal of create, create, distribute, serve the audience. You can go quite far under those conditions if you’re allowed to work without the distraction of your site from the technological standpoint. Now, Rainmaker is a whole different animal. You’re taking it to the next level of sophistication. Rainmaker started out as a very powerful and complete website solution, but that’s not what it is. It’s a website solution that’s married to email and marketing automation so that you can take your adaptive content marketing to a level that no one’s ever been seen before. When things adapt based on the behavior of your visitor, not just you get a different email or a trigger happens here and then this happens. It’s more like the entire nature of the site can change to fit the experience at that person’s … whatever leg of the journey they’re on, if that makes sense. Robert Bruce: Meet them where they are. Brian Clark: Exactly. And you can’t do that with StudioPress Sites, but it’s probably not necessary during your beginning phases of really getting maybe even a digital commerce business rolling or maybe just marketing your service business. You don’t need all the bells and whistles yet. It’s my opinion that you will because everyone is getting more sophisticated, and people will then start to expect these types of things. But then again, asking you to run before you walk, it doesn’t make a lot of sense. This was the gap in the market that we identified, not just looking out the window, but listening to our customers. Frankly, some people just don’t like the fact that they can’t add their own plugins and what not to Rainmaker. That’s fine. That’s a different type of customer, and we’re interested in, like you just said, meeting people where they are. If this is what you want, then StudioPress is the right answer. Eventually, as you succeed, you’re going to want to look at Rainmaker. I hope that helps answer that question. Are Marketing Automation Funnels a Fail? Robert Bruce: So, Brian, speaking of marketing automation, you found an interesting … well, actually, it’s an email. I was going to say article. It’s an article within an email from the CEO of MailChimp, Ben Chestnut. Brian Clark: Yeah, it’s interesting because I saw this on Twitter. It was being shared, and it’s actually from 2013, from Ben Chestnut who’s the founder of MailChimp, an email and marketing automation provider. The title is Why I Hate Funnels. That may seem odd coming from a guy who sells the kind of technology that allows you to build funnels. But it’s really not, and here’s why. So for example, at the end of the year, the last episode of Unemployable for 2016, Darren Rowse and I got on the call and had old blogger week and talked about the changes we’ve seen over the last decade and what remains the same, what’s different. And the technology is so amazingly more advanced than it was back when we both started, 2005, 2006. But something odd happened along the way. Maybe it’s just the nature of human beings. 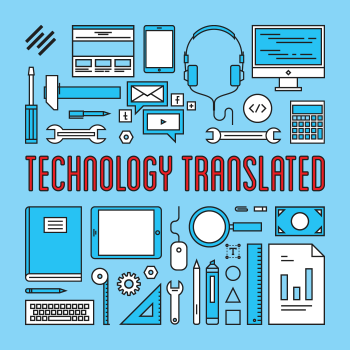 The technology started to take over, and yet the content was starting to lose the element or the aspect of it that actually connects with human beings. 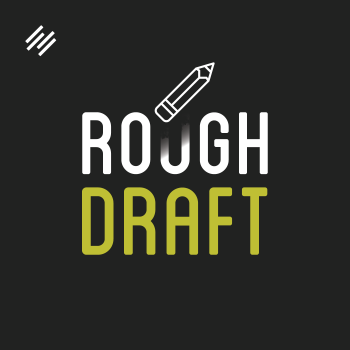 So that was part of my first post of the year coming back to Copyblogger, was back to basics. Not that you shouldn’t use technology. That would be dumb for me to say that, obviously, as someone who is an advocate for the Rainmaker Platform. But without knowing who you’re talking to, understanding what they need to hear, and more importantly, delivering that information how they need to hear it, you’re not going to succeed. You’re just going to get people into your funnel and spam the hell out of them. That’s exactly what Ben is saying, which is, “This isn’t going to work because it’s like a meat grinder,” I think was the metaphor he used. What was your take on it? You know where we’re coming from on this issue. And I don’t know if it’s surprising, but it’s heartening that a guy who runs a much larger automation company feels the same way. Basically, you’ve got to serve the people first, and then the technology can enhance that experience. Robert Bruce: Yeah, as he goes into customer service in this — and we’ll link this up of course, which I want to talk about in a minute, the customer service aspect of it — what struck me first, though, was this idea that you look around and a lot of scumbags, for lack of a better term, a lot of people use funnels and this funneling process or this concept, this metaphor, as a crutch I think. As a crutch for sh*tty products and services. They’ll put this whole thing together based on what they’ve read or seen and all this automation, all these pieces, all these cookies, and the whole product from top to bottom, and they’ll think, “Great, I’ve done it. I’m done. I can sell my crappy product or service, and this will do it for me,” and away we go. It’s just not that way. Yeah, whatever, maybe you’re going to make some money. Maybe you’re even going to make a lot of money, but it’s not business. I take this more as, instead of the funnel being a crutch, an ability to expand and back to, again, meeting people where they are for the products that we sell, the software that we sell. We use some pretty sophisticated things in some cases, but we’re not relying on it wholly. First and foremost, you’ve got to have a great product or a great service to sell, to offer, and then laying these principles on it is what can expand and open the world to you. Brian Clark: I agree 100 percent. And the funnel, how many years have we been saying it’s a bad metaphor? I think it encourages the wrong kind of thinking. It’s not an audience first type mental model. So we’ve used the concentric circle model, where the outer rings are colder, you progressively bring people in closer to you, and the relationship warms and warms until they’re a customer and a repeat customer, recurring customer, whatever the case may be. I like that one. But even better, as we’ve just gone through this content marketing strategy, five weeks in a row I showed up and laid that thing out. I think it was like 8,000 words. But the who, the what, and the how is really enveloped within a metaphor of the prospect going on a heroic journey in which you guide them. Now, just think about the different metaphors because metaphors are important. They change the way people think. Which one is more likely to make you genuinely find out who it is you’re trying to help here? But at the bottom of it all, you’re really serving your audience. You’re really serving your paying customers — and this is business. We’re not talking about religion here. But you’re serving them in a way that makes sense, meeting them where they are, in order to do better business. But service is the all-important word. Brian Clark: Yeah, it is. Robert Bruce: Because if you’re in it for you, if you’re in it to do the meat grinder, the cashing checks and the ATM, and grinding people through your automated process through your funnel, whatever, there’s all kinds of ethical problems with that, obviously, that you don’t want to even get into. But it’s just dumb. It’s also just dumb. Brian Clark: Well, here’s the irony here. Right now you would expect me to start ranting against the Internet marketing gurus who basically shovel tactics and techniques related to technology at people without teaching them the things we’re trying to teach people at Copyblogger about not only knowing who you’re talking to but choosing them based on core values. The get-rich-quick type doesn’t have any core values other than they want to get some money, so they’re doomed to fail. But here’s the irony. Because the people who teach them, those gurus, they do know who they’re talking to. They do know what to say, and they do know how to say it for that type of person. I made it quite clear in the who portion of the content marketing strategy series that this isn’t all sunshine and light about Patagonia, Ben and Jerry’s, and Save the Whales. Some people are motivated by greed. Some people are motivated by, “Get me some money fast.” The gurus know exactly who they’re talking to. They do follow a process similar to this hero’s journey thing. It’s just, in this case, your hero is a short-term thinker who’s never going to succeed pretty much at anything. I hate to be harsh, but you’re not going to make it. You can’t really. Other than I would never want to be one of those guys who takes advantage of fools, but hey, at least they know what they’re doing, ‘they’ being the gurus. They do follow this exact process. If they were also teaching the process, then those people would either say, “That’s too much damn work. Who’s going to do all that? I don’t care about these people. I’m just trying to make a living here.” “Well, guess what, buddy. I’m a multimillionaire. I do all this work, and you’re broke.” So who’s the smart one now? Robert Bruce: Well, and what are you in this for? A lot of these people, if we look around in 10, 20 years … you said the word ‘tactics.’ The complete focus on tactics as opposed to the whole idea of the business, which includes customer service, which includes making an incredible product or service, which includes then reaching out and using that intelligence that you’re talking about to actually talk to those people and have an opportunity to get your product or service in front of them. But one thing that keeps coming back to me is the most powerful marketing there is, which is word of mouth. If you’re one of these churn and burners, what’s that word of mouth going to look like? We’ve all seen it. We’re talking about it in a sense right now. Brian Clark: And a day of social media, it’s brutal, too. Pre-2005, you could get away with a shoddy ebook thing or whatever. Remember those days? 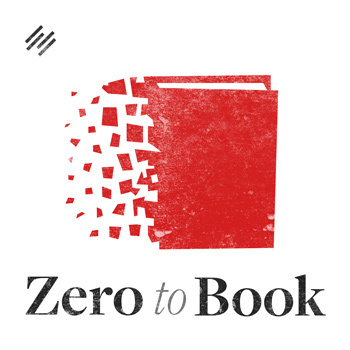 Brian Clark: You can’t do it anymore. And the consumer is so much more sophisticated anyway. So odds are, you’re not going to sell anything in the first place. Robert Bruce: Nope. And even if you do, it’s going to be super short term, and you’re not building a business. 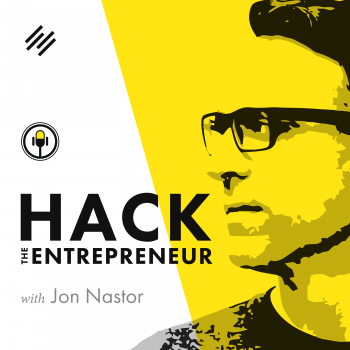 You’re not building a business for years and maybe even decades to come if you do it right. Brian Clark: All right. Well, if this is an indication of our renewed collaboration, I’m excited. It’s been fun talking to you my old friend. I will talk to you again next time week. 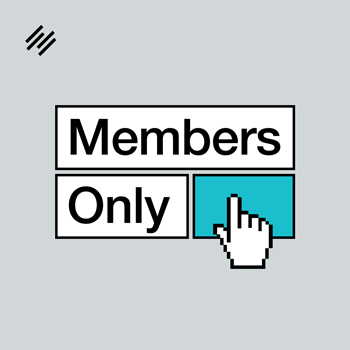 Where should people go if they want to check out the all new StudioPress Sites then? Robert Bruce: Okay, first of all, you just want to go to StudioPress.com. Our man Rafal did an amazing job of redesigning the site. You worked on and did, as always, that homepage copy. Everything there you’re going to see is brand classic — classic if I might say, Brian and Rafal. But go to StudioPress.com. Check it out. See what StudioPress Sites is about. You heard Brian talking earlier, but it’s all right there, not in black and white, but in blue and black and white and red. 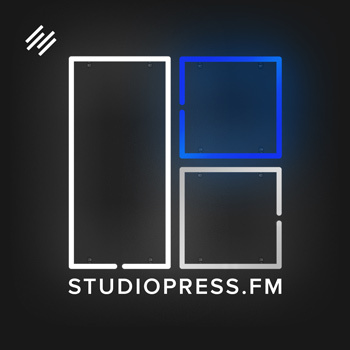 StudioPress.com. Brian Clark: It’s actually quite vibrant. Robert Bruce: Yeah, it is. It’s really cool. It’s a really, really great site. Then, also, if you will allow it, Brian, along with that, Mr. Gardner and I — Brian Gardner, the founder of StudioPress — and I just launched the StudioPress Blog, relaunched. And that’s over at StudioPress.Blog. Brian Clark: Excellent stuff happening over there with Mr. Gardner. All right, everyone, if you are sick of me saying serve your audience and you’ll get everything you want in return, it’s time to stop listening to this show. I’m going to keep saying it. For those of you who get it, you’re working on it, and you’re pushing it every day, you know what I’ve got for you. Keep going. The pre-written lessons you launched with were 10x the pre-written recent lessons.